Asparagus is the green, stalk vegetable of a flowering plant bearing the same name, believed to be a native plant throughout Europe. The shoots of this plant are used in cooking and are thought also to be of medicinal value in the treatment of various ailments, such as arthritis. It´s a good source of vitamins K and A, as well as of iron and copper. Asparagus is served steamed, blanched or roasted in soups, salads, or plain. To remove the tough portion of the stalk, bend the asparagus; the stem will snap at the right spot. Asparagus usually refers to the stalk of the asparagus plant, which has small, scale-like leaves on the tip. The stalk grows along with feathery leaves to the outside, which are not eaten. Asparagus is usually eaten when the stalks are very young and tender. Ideally, you'll buy fresh asparagus and prepare it the same day, but you can find frozen spears all year round. 1. In Season: Fresh asparagus is in season from late February through June. 2. Off Season: You can buy asparagus canned or frozen, or find fresh asparagus grown in a hothouse or imported from warmer climates. 3. How Much: The general rule is 1.5 pounds of asparagus for 4 people. 4. Thick or Thin: The size of the asparagus you buy has more to do with personal preference than taste. Martha Stewart says the thick stalks are often just as tender and delicious as the thin ones. 5. Tips: Whichever size stalk you choose, the tips should be closed. 6. Eat Fresh: Although you can store asparagus for 3-5 days in the refrigerator, you should cook it as soon as possible to take full advantage of its great flavor! Buying: It is best to buy at the peak of freshness, so look at farmers' markets locally. The spring months are the best time to purchase asparagus. But if you're too busy, you can just get Asparagus from your nearest supermarket or grocery store. If you've been hankering to plant some edibles among your ornamentals - or vice versa - asparagus is the plant to start with. It's a warm-season veggie with fernlike foliage - bright green in summer, golden in autumn - that's stunning enough to grace any ornamental border. Choose a site where your plants won't be disturbed - and where you and they can happily coexist for 10 to 15 years. Make a 7-inch-deep, V-shaped furrow (or more, depending on how many crowns you're planting) and in each one spread a handful of wood ashes, a handful of bonemeal, and an inch layer of compost or well-rotted manure. Fill in the furrows gradually as shoots emerge, taking care not to cover any foliage; eventually, the furrow will be level with the soil surface. Don't bother spreading out the roots; they'll find their way down. Weed diligently and mulch heavily with chopped leaves or straw after you've filled in the furrows. Refrain from harvesting any spears during your plants' first year in your garden. Each spear needs to "fern out" so that the roots can grow stronger and more productive. The second year you can pick a few that reach about the size of your index finger. The third year, pick finger-size spears for two to four weeks in the spring. In subsequent years, take all the finger-size spears you want for six to eight weeks, or until the spears that come up are thin and spindly. Asparagus is well worth the three-year wait it takes before you can harvest your first full crop. A well-tended bed will give you tender, delectable spears year after year for a decade or more, at a tiny fraction of the price you'd pay at the supermarket. The experts disagree about when to cut down asparagus foliage: in the fall to keep pests from moving in for the winter, or in spring so that the foliage can protect the crowns through the winter. The choice is yours, but if you cut in autumn, do it after a few killing frosts have struck, and then mulch the bed. If you wait till spring, cut the foliage to ground level before new spears start popping through the soil. 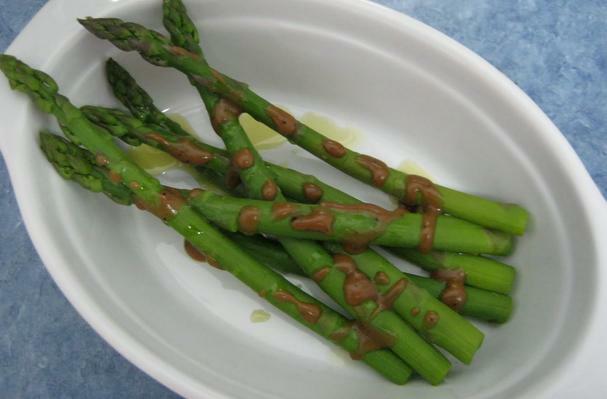 In some regions, asparagus tends to suffer from fusarium wilt. Check with your county Extension Service; if the disease is a problem in your area, order certified disease-free crowns from a reputable nursery in another part of the country. Asparagus should be cleaned well and if the thick ends of the stalk are too fibrous, they can be snapped off. Aspargus can be steamed, or boiled upright with the leafy tips out of the water. It can also be stir-fried for 2-3 minutes, or grilled briefly. Cleaning: Gently scrub asparagus under running water, paying more attention to the thick ends of the stalk, where dirt may have collected. If the stems seem tough or scaly, you can use a vegetable peeler to remove the skin from the bottom third of the stem. These delicate vegetables need moisture and can't be stored for long. It's best to use them soon after purchasing. Wet a paper towel and wrap around bottom of asparagus stalks. Put in coldest part of refrigerator, preferably the crisper. Store for no more than 2-4 days. You can also stand asparagus in 2 inches of water and place in the refrigerator, with a plastic bag over the tips. Flavor of asparagus will lessen each day it is stored. Asparagus does not lend itself to drying or canning, but can be frozen. They can also be pickled via lacto-fermentation. In the 16th century, asparagus gained popularity in France and England. From there, the early colonists brought it to America and often called the “Food of Kings”. King Louis XVI of France, who did indeed dress in silken splendor when he dined, was so in love with asparagus that his gardeners were instructed to grow it in hothouses for his year-round pleasure. History: There are records of asparagus being grown for food in Ancient Egyptian artwork, perhaps as long ago as 3000 BC. Asparagus name is derived from Greek word asparagos. It’s native to the East Mediterranean area, cultivated form antiquity and now grown in much of the world. Asparagus cultivation began 2000 years ago in eastern Mediterranean region. Greeks and Romans ate it fresh when in season and dried the vegetable for use in winter. Having appeared in England as early as the year 1000, it was known as sperage and sperach. Asparagus has been used as a vegetable and medicine, owing to its delicate flavor and diuretic properties. Contrary to ridiculous dogma, asparagus is delicious with wine. I especially like it with a zesty Sauvignon Blanc.